For leaking defenses everywhere, your solution has arrived! Team Zonal Defending provides an in-depth look at organizing your back four, midfielders and forwards for total team defending. 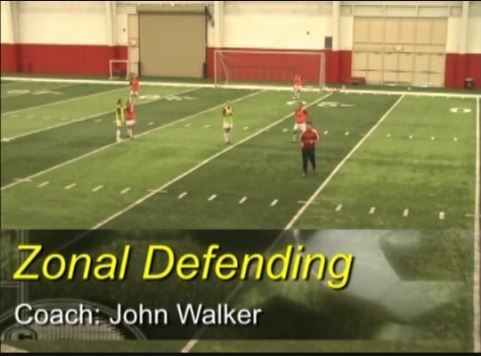 In Team Zonal Defending, University of Nebraska Women’s Head Coach, John Walker, provides an in-depth look at training the back four defenders in all aspects of zonal defending. Exercises are set up to work on sliding side to side, staying compact as a group, recognizing the “Drop Distance”, recovery runs, defending counter-attacks, interceptions, defending wing attacks and many other important aspects of zonal defending. The exercises progress to include midfielders and then on to an 11v11 situation. These videos contains exercises and progressions that will help you teach your players all aspects of zonal defending. 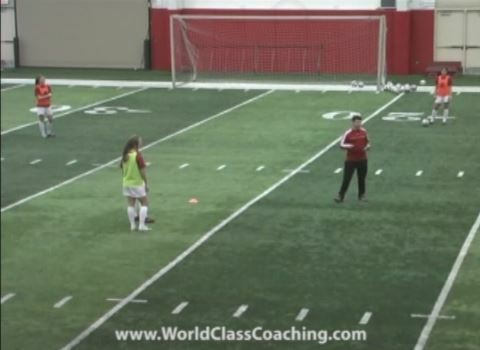 These five videos show University of Nebraska Head Coach, John Walker conducting a training session where he shares practices and drills that you can take to the field to use with your own team. These drills are all defending orientated showing functional exercises for the back four and the entire team…forwards are critical to defending too. It doesn’t matter how good your team is, or how capable they are of scoring goals, if you are poorly organized when you don’t have the ball. If you are not organized defensively and you keep giving goals up, it not only will make it difficult to be successful but it destroys the confidence of your players. Coach John Walker became the Women’s Head Coach at the University of Nebraska in April 1994 and 19 seasons later, he has built a tradition rich program at Nebraska that includes 10 NCAA Tournament appearances, two trips to the Elite Eight, six trips to the Sweet 16 and eight conference championships. With a proven system, an innovative coaching philosophy, a well-respected program and an ability to recruit some of the nation’s most talented players, Walker has the Huskers focused on contending for conference and national championships on an annual basis. Walker also has helped Husker players compete at the international level. Over the past several seasons, Nebraska has boasted 24 players with national team experience. 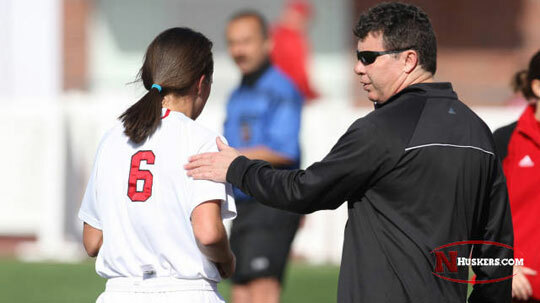 Walker was named national staff coach for the Canadian Soccer Association in 1992, and the following year he was appointed an assistant coach for the Canadian World University Games team. Walker holds a Canadian “A” coaching license (highest level), a Level V certification and a USSF “A” license. WORLD CLASS COACHING is recognized globally for the quality of its soccer coaching resources, which are used by over 40,000 soccer coaches from around the world. Team Zonal Defending unless it achieves our exceptionally high standards. 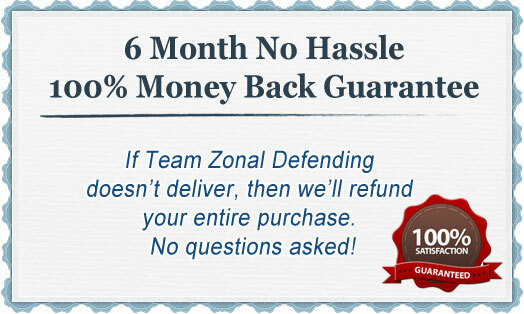 However, if you are not 100% satisfied with the quality of Team Zonal Defending after six months of implementing its drills and exercises then please contact us for a no quibbles refund. If your defense is conceding too many goals, breaking down under pressure or clueless as to how to defend an aggressive 4-3-3 or 4-3-2-1 attacking formation, then these videos can guide you on practical improvements you can make to tighten your backline and organize your midfielders and forwards defensively. These videos provide an in-depth look at team defending and are packed with valuable information you can use to improve your team’s defense. P.S. Team Zonal Defending is a unique video series that enables you to watch a complete training session conducted by one of the college games most experienced coaches, John Walker. You get the entire session, from start to finish, that shows you specialist drills and exercises that you can take on the practice field with your own team. P.P.S If you are not 100% satisfied with the quality of the soccer coaching resources in Team Zonal Defending within six months then we will refund your purchase in full, no questions asked. One last thing. If you are a subscriber to the WCC Video Library, these videos are included so there is no need to purchase them here. Just log in to the WCC Video Library and do a Keyword search for “Walker”. If you are not a subscriber to the WCC Video Library, check it out here as you can have access to these videos and hundreds of others for one low price instead of paying separately for each set of videos.